Geologger allows you to log you position during photo shootings or journey. All logged positions are stored in a database locally on the device (no internet connection is required), and organized into tracks. Each track can be downloaded as GPX file on computer via a web interface. 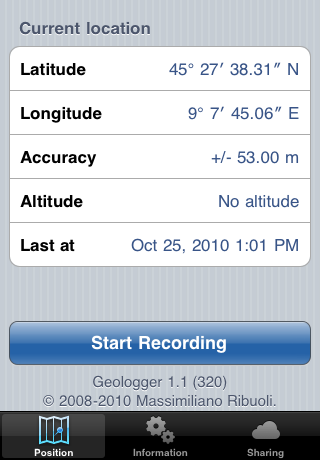 Pre iOS 4.0: Due to limitations imposed on third-party applications by Apple, Geologger must run in the foreground and the device must not be in locked state to allow the application to receive location updates. Log duration depens on battery charge, the use of a backup battery pack is suggested. 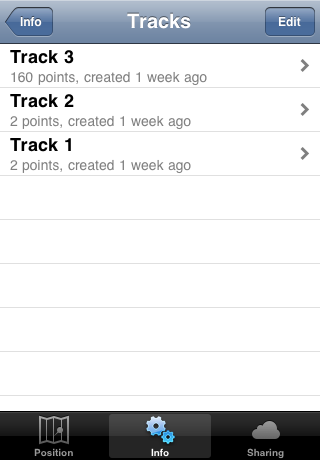 Added feature to share tracks with email. Sharing can be enabled only on WiFi networks. Why does not iPhone turn into sleep mode while Geologger is running? Geologger keeps the screen lit while running to prevent the phone from going to sleep and powering off GPS. As a result, battery life is only 4.5 - 5 hours. Minimize screen brightness to extend battery life, or an extra battery pack can be used. Is iPhone being tracked all the time? iPhone stores tracking data only when the application is running. 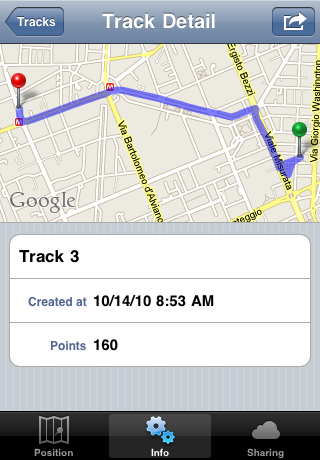 Due to limitations imposed by Apple, third-party applications can't run in background, so Geologger must be in foreground to keep tracking positions. Does Geologger need an internet connection to operate? No, Geologger stores data into a database located on the iPhone. Internet connections are never used. How much historical data does Geologger store? As much as free memory space is in the iPhone running the application. How can tracks be deleted to get more free memory? 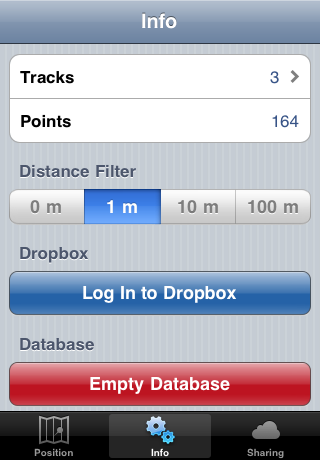 Single track can't be deleted, through Settings panel the entire database can be emptied. How can I write GPS informations recorded by the application to my image (RAW, JPEG, etc.) files? Software like Ovolab Geophoto allows you to apply gps information on images. For more information about other issues including feature requests and bug reports, please visit http://support.ribuoli.it/projects/show/geologger.